Madness Cycle is an Authorized Champion Trikes dealer offering trike Kits for the Harley Davidson models; from the simple yet sporty kit for your Sportster and Dyna models, to the kings of the Road such as the Electra Glide, Ultra Classic, Street Glide, Road Glide, Road King and, of course, the Softail Models; we have a kit to suit your needs. Everyone knows Champion Trikes is the leader in Trike kit manufacturing today. 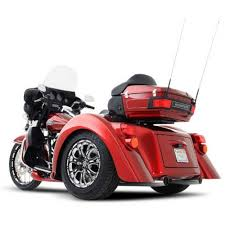 Champion Trikes manufactures both solid axle trike kits for the budget minded motorcycle rider and fully independent rear suspension trike kits with optional rider controlled variable sway for the best riding trike kit on the market. All Champion Sidecar trike kits purchased through Madness Cycle come with a full 3 year unlimited mileage manufacturer’s warranty. So you can ride with confidence that you are on one of the best riding, best driving, best backed trike conversion kits on the market. Call us today to begin you voyage!!! We look forward to hearing from you!